The protests in the winter of 2011-2012 used "For Fair Elections" as a slogan. Subsequently, many politically active citizens became observers at the presidential elections that March. This year, the Election Commission is being formed five years early. 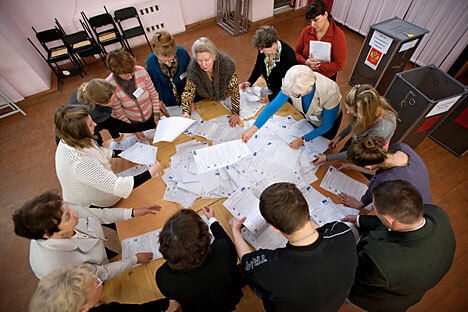 What is the Russian Election Commission, why is it needed and how does one become a member? The day after the 2011 parliamentary elections, I was one of those who went to Chistoprudny Boulevard in the center of Moscow. Many people came that day because a large number of videos showing overt violations of the electoral process had been posted on the Internet. This included stuffing the ballot box, intimidation, multiple voting and other types of election fraud. Few people were asking if the videos were authentic: However, if even a tenth of them were, then what was happening at the polling stations where there were no observers with cameras? It was then that I realized that the only way to ensure the elections were legitimate was to protect them from fraud myself. To become an observer, I turned to the Rosvybori project. With this service, you can fill out an application with your contact details, get in line, and have the opportunity to become an observer for any political party. The main goal of the project is to have at least one independent observer at as many polling places as possible. Each observer must represent one of the candidates. I was an observer for presidential candidate Mikhail Prokhorov, a businessman. I could have been an observer for the communist candidate or any other candidate—it did not matter. I wanted to influence the authenticity of the voting, not the results. On voting day, I arrived exactly at 7 a.m. to my polling site and met the voting commission. The next 22 hours (including seven hours for counting the ballots) were spent with other observers and members of the commission who were organizing communications and doing everything possible to eliminate any doubts about the legitimacy of the results at this site. Most of the observers were newcomers, like me; however, a few professionals came with complaint forms filled out in advance. There was a risk of falsification; we received texts warning about suspicious organized groups of people or violations at the sites. Yet we achieved what we set out to do—we defended the ballots at our site. This year, there will be 3,411 polling sites during the mayoral elections in Moscow, but only 1,035 sites will have electronic ballot boxes. It is believed that computerized vote counting is much more difficult to falsify. This leaves more than 2,000 sites that need observers. I cannot miss an event like this. However, this time I will have a different role—as a member of the Election Commission with the right to cast a deciding vote. Becoming a member of the Election Commission is a logical step for any observer. Commission members are involved in all organized voting: They cannot be removed from the polling site; they hand over the ballots, count the votes and sign the final report. An observer can approach a commission member with a complaint and the member casts the deciding vote. The combination of observer and member with a deciding vote is the most effective way to oversee the elections. I became a member of the Election Commission with a deciding vote the same way as I became an observer—through Rosvybori. I was contacted by the coordinator for my region in Moscow. This time I was assigned by quota to the Spravedlivaya Rossiya (Just Russia) party. As with monitoring, the party assignment does not obligate the observer to take into account the interests of party; they are still independent. It is important to note that, although all members are formally assigned to represent a party, they all work as one team. The legitimacy of the elections is the most important unifying goal for everyone. This year, the commission is being formed five years ahead of time, and not right before the elections as in the past. They will be working for four Russian elections—those for mayor, president, the Moscow parliament and the State Duma. However serious the work may be, an application to Rosvybori can be filled out in just five minutes. We learned how to deal with any situation in just a few days, and several training sessions are enough to feel confident. To prepare for all possible scenarios, some unusual training session are held. For example, at one of the sessions, everyone was divided up into experienced observers and beginners. Newcomers were asked to leave the room for a short time, and we were given the task of falsifying the elections by intimidation, ballot-box stuffing, forging documents, etc. One day of hard work at the site and a few days of training is not a high price to pay to fulfill your civic duty. If there is an opportunity to make elections more open, legitimate and just plain organized, we need to do it.